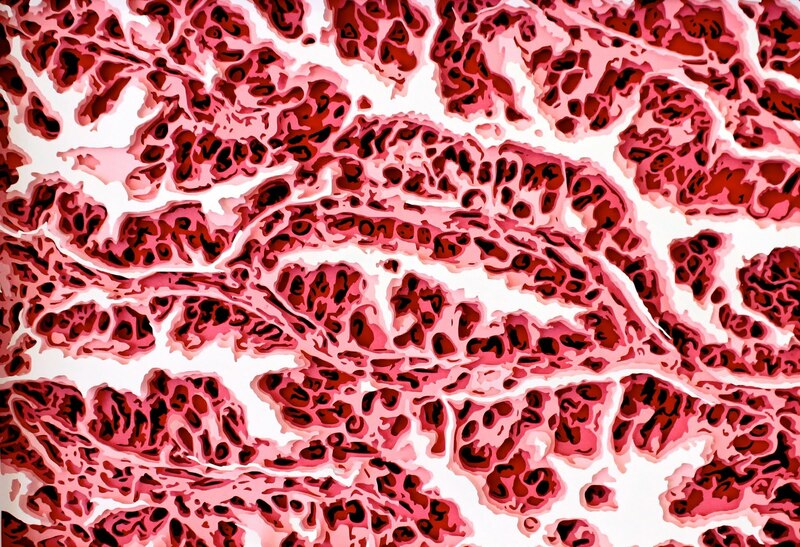 Visualising lung-cancer in a way to raise awareness, I created a multi-layered paper cutting representing a lung cancer Tumor as seen through a microscope 20x closer. The paper-cutting, which excists of 7 layers of different tones of pink paper, was then photographed to create this illustration. The original piece is 3D and is framed. The cancer cells have been cut away from the paper, leaving behind the 'healthy' tissue in a way to resemble cancer-surgery and the progress we still have to make to find a cure for this terrible disease that is disgusting yet weirdly beautiful when seen from up close. My aim with this piece was to create a realistic visual of 'cancer' in a way to raise true awareness of what this disease entails. It is not cute with a little pink bow – it is dangerous.